Every now again, I like to talk about beauty on the blog. I'm a little bit of a make-up junkie, but by no means an expert. I just am fascinated by trying new products and brands and since the world of make-up is in an ever changing state of advancement, there's a never ending supply of new things to try. Today, though I want to talk about beauty multi-taskers! I want to talk about those products that you'd stash in your purse or pack in an overnight bag whenever your full make-up arsenal can't be available. Personally, the conscious thought of these multi-taskers came to me when I was packing a little overnight bag for my 21st birthday. I wanted to make sure I had a few things to touch up while out and wanted those same things to wear the next day. I wanted to keep my overall product haul very limited. So I started reaching for essentials. First, I reached for me Tarte Cheek Stain. Tarte is one of my favorite brands, so I was thrilled to be gifted a mini version of one of these cheek stains for Christmas. I've been using it happily on my cheeks and on my lips for the past few months. This product looks perfect on cheeks, but it also doubles as a lip tint. I love that if I'm in a pinch, I can use this product on two areas of my face and have it look successful on either. Plus, the smell/taste is nice and fruity. Secondly, I grabbed my mini version of Benefit's Watt's Up Illuminator. Illuminator is a great beauty multi-tasker. It's perfect to wear the corners of your eyes, on the brow bone, to disguise under eye circles in a pinch, to swipe on cheek bones, and to use as highlighter. Whenever skin needs a boost, this little stick of genius perks up skin, making it look radiant. 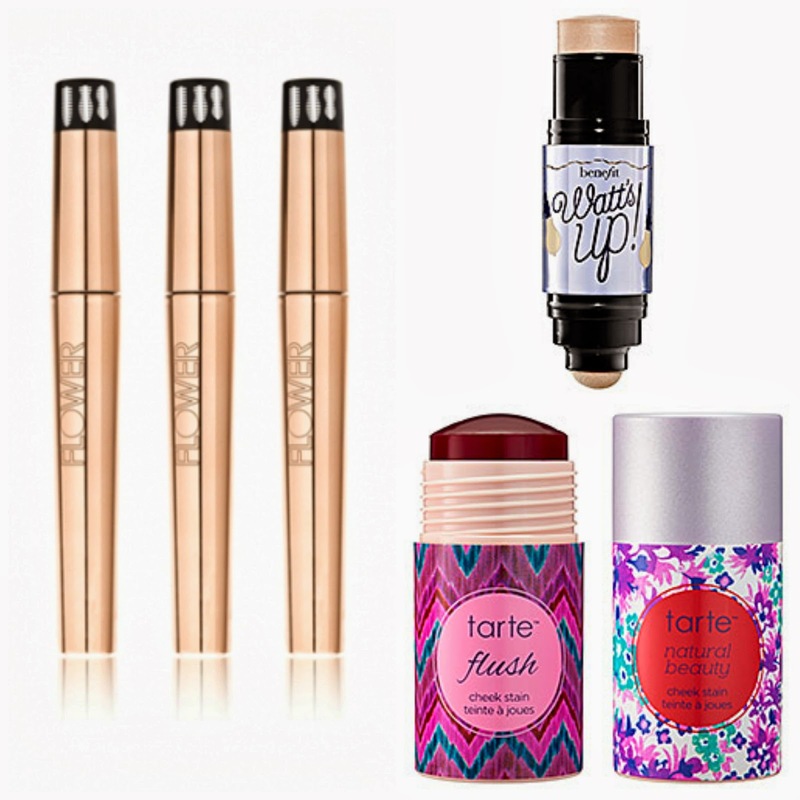 I also like Tarte's Illuminating BB, but find the Watt's Up stick a bit more portable! The last product I reached for was Flower's new Zoom In Ultimate Mascara. To be honest, I wasn't expecting much from this mascara and was especially skeptical of the twisting brush. This mascara offers three different brush settings (straight bristles - for length, semi-twisted bristles - for curl, twisted bristles - for volume) all controlled by twisting the top. However, after a few uses, I've really grown to like this mascara. It performs on par with other drug store mascaras, even better than some. It's brush is similar to that you could find on a high end mascara and I'm effortlessly awed by the twisting brush. I prefer to use this mascara on the straight bristle setting, but it's great to know that I can change my mascara's look at a twist. It's like having several different looks in one tube. Other beauty essentials I stashed in my purse that were a fluffy powder brush, an eye shadow brush, translucent powder (to nix an oily complexion), Boi-ing concealer, lipgloss, and make-up wipes. What are your favorite beauty products/beauty multitaskers that just go the extra mile? Also, what are the products you'd choose to take with you overnight/a night out?